Your goal: build a cast of characters for your comic book. 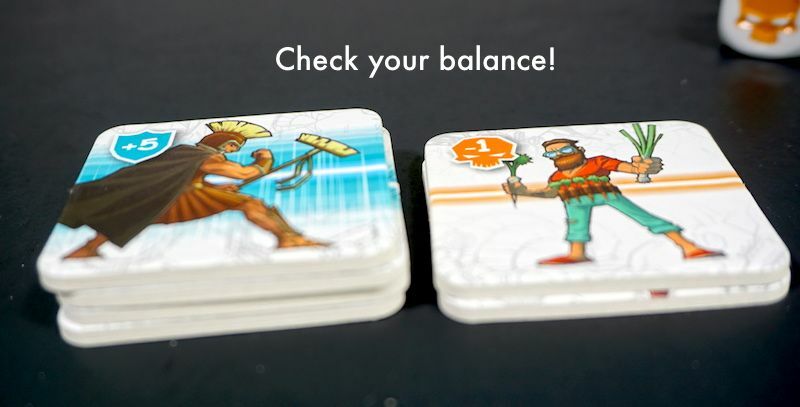 Collect both superheroes and supervillians, to create a balanced comic. Listen to our SNAP review of POW! in 5 minutes, or read on below. Setup by randomizing the superheroes (blue/teal) and supervillians (orange), then lay each type out in a line. Roll the five dice. 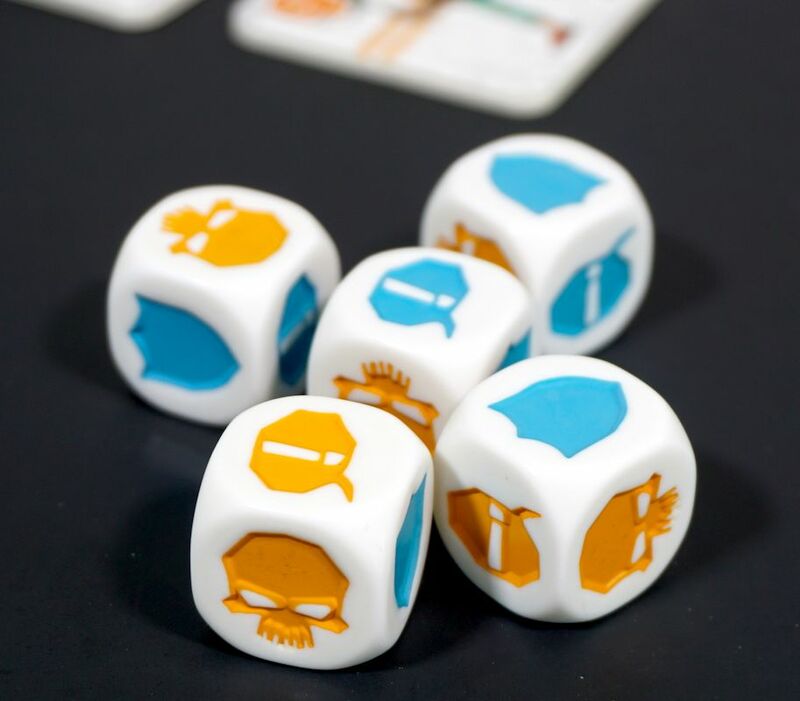 You are allowed to re-roll twice, as long as you set aside at least one additional die to keep before each re-roll. 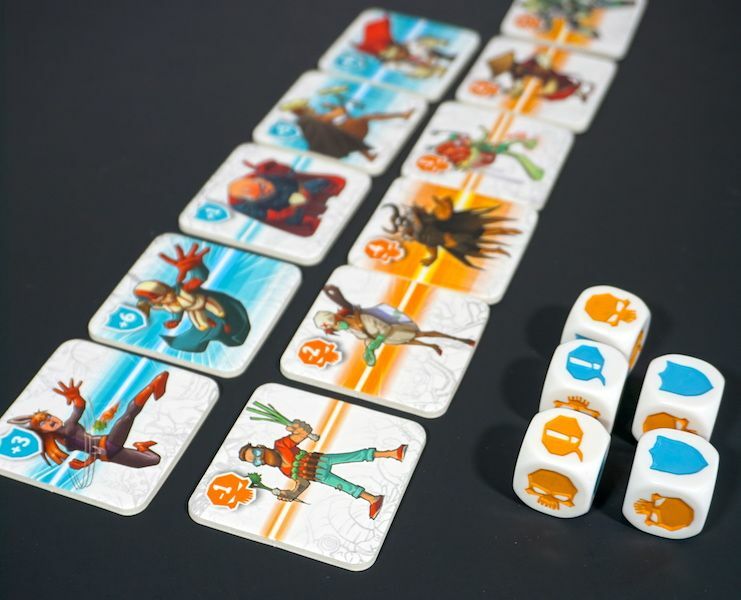 Symbols on each die include: 2 blue shields, 2 orange skulls, 1 blue “speech bubble” (exclamation point), and 1 orange “speech bubble”. When you are done rolling, you take a superhero or supervillain from the appropriate place in line (count the number of shields for a hero, count the number of skulls for a villain). If you have rolled enough matching speech bubbles, you may steal a character from a neighbor instead of taking from the line. The object is to have the highest victory point total. Heroes give positive points, and villains subtract points. One of the tricky elements to the game is that you must have both heroes and villains. The game ends when all tiles have been taken. Then players must examine their stacks. If your superhero stack is taller, you must take heroes off the stack until it matches the height of the villain stack. If you have more villains, you’re OK. Then add up your hero points and subtract your villain points. Acquire another villain, or you will have to discard the mighty Broom Centurion! POW! is somewhere in between a press-your-luck game and a set collection game. Don’t roll too high! You need to roll the exact number for the hero or villain you want. There is a memory element as well, since characters are stored in your stack and you are not allowed to look at other players’ stacks, although you may name off which position you’d like to steal. We feel that POW! plays best at 3 players or more. We love the art; all the heroes and villains have very comical personalities. This is a game that does not take itself too seriously. Check the inside box cover! Take a peek at the 90 second How To Play video from Gigamic’s website. Find POW! for under $15 on Amazon, or wherever Gigamic games are sold. 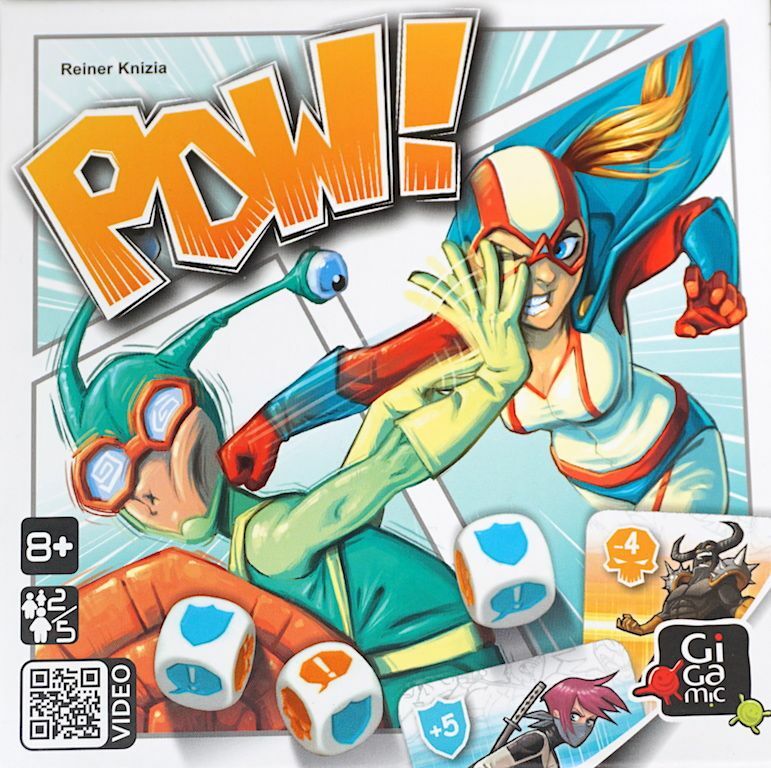 The Family Gamers received a review copy of POW! from Gigamic.